The Series CWB-130 cylinder warming blankets are used to warm cylinders of gas mixtures to maintain a uniform composition. They are particularly useful when the mixture contains low vapor pressure components that may partially condense and change the mixture composition if exposed to lower temperatures, thus making the mixtures analysis unreliable. 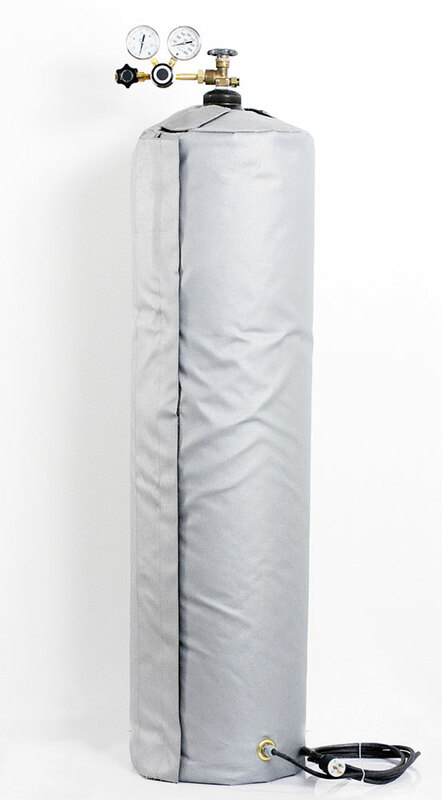 These blankets are a combination of cylinder heater and insulating blanket. The blanket creates a convection current in the cylinder to maintain a homogenous composition by heating the lower portion of the cylinder more than the upper portion. Models available for both hazardous and non-hazardous areas. Sizes available to accommodate 15”, 10”, 9”, and 8” diameter cylinders. Optional cylinder base insulation pads valve cover are available to further reduce heat loss. Power rating: 75 watts, 0.45 amps. Power: 120 VAC, 5-60 Hz standard, 220 VAC optional. 2” thick side and 0.5” top insulation of moisture and oil resistant rigid fiberglass to create insulation jacket. Velcro® fasteners for ease of installation. CSA approved (optional ATEX approval available). Power cord: non-hazardous area – 10 foot SJOW cord hazardous area – 10 foot Teck 90 cable. Hazardous area rating: Class 1, Division 1, Groups B, C, & D.